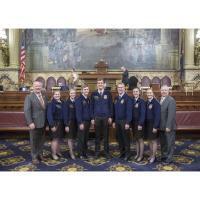 A resolution sponsored by Rep. Mark Keller (R-Perry/Cumberland) that designates the week of Feb. 16-23, 2019, as “FFA Week” in Pennsylvania was unanimously adopted by the House of Representatives today. FFA was founded in 1925 in Virginia by agriculture teachers for middle and high school students to promote and support agricultural education. FFA has more than 670,000 members across the country, which is an all-time high. There are more than 12,000 members in Pennsylvania. Keller was joined in the House chamber by the state FFA officers, whom he introduced after the vote on House Resolution 45. On Monday, Feb. 4, the state FFA officers visited the Pennsylvania House of Representatives to witness the unanimous adoption of House Resolution 45, which designates the week of Feb. 16-23, as “FFA Week” in Pennsylvania, sponsored by Rep. Mark Keller (R-Perry/Cumberland). Pictured (from left): Keller; Millena Bashore, chaplain; Abigail Yoder, treasurer; Sam Loy, reporter; Jacob Kinzer, vice president; Roarke Miller, sentinel; Jenna Harnish, president; Morgan Bear, secretary; and Mike Brammer, Pennsylvania FFA Association executive director.